If you are looking for Makeover Photography Birmingham we ask if you could consider following in the footsteps of many of our happy clients from the Birmingham area who have driven half an hour or so out to see us in Kidderminster. We regularly meet and photograph clients from all parts of Birmingham who are looking for a high end fashion style makeover photography experience. We offer a personal, friendly and professional makeover photography service which will allow two clothes changes – a full hours portrait and fashion style photography shoot with our makeover artist on hand throughout the shoot to help and guide you and keep a constant check on your hair and make-up. We then edit your pictures to the best 100 or so, give them all a light skin smooth and airbrush and conjure up some great post production to show you your pictures in a variety of black and white, sepia, fashion bleach and colour. We offer a wide variety of fabulous deals on our Birmingham Makeover Photography with a choice of 6 popular print, frame and album selections saving 100’s of pounds. We also have a huge range of frames canvasses and wall art to choose from as well as our superb Italian GraphiStudio Coffee table books. We are not a production line we are a small boutique studio with over 18 years experience in makeovers and a real passion for this creative style of shoot. We attract those who are interested in working with us to create amazing images albums or wall art, those who want the very best photography and photographic memories that will last for a lifetime. As well as our top reviewed Birmingham Makeover Photography ( Have a look at our many genuine 5 star reviews on facebook ) for girls and ladies of all ages we also offer our extremely popular ” mother and daughter makeovers ” a very special time for both daughter and mother who get to spend some real quality fun time together and then receive some amazing images to remember the experience by. We also have our customised bespoke Birmingham makeover photography service designed to offer those thinking of starting a model portfolio or who would just like to try their hand at a fashion style photo-shoot the opportunity to have their own style captured beautifully. 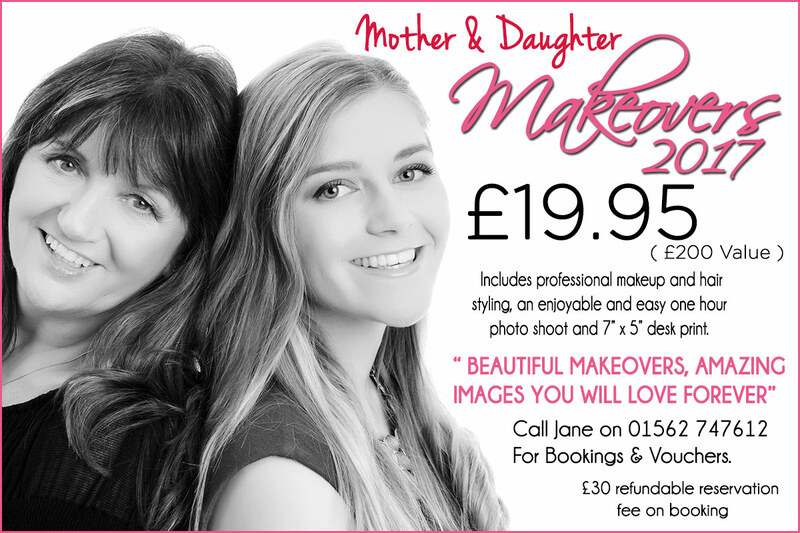 Whatever you have in mind call Jane on 01562 747612 and ask about our model makeover sessions the perfect confidence boost for anyone considering our stylish high end makeover photography. We may also be the perfect studio for those looking for makeover photography Wolverhampton, Makeover Photography Solihull and Makeover Photography Halesowen.